Recorded webinar hosted 06/29/11: New Legislative and Case law Developments in Foreclosure, Bankruptcy and Eviction Law. (Laws and rulings are changing monthly. More are on the way. Don’t get left behind). 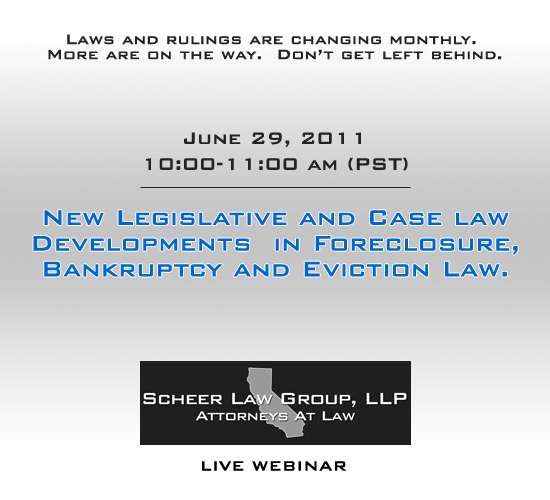 SB 931: New Short Sale and Anti-Deficiency Protections. Can they be waived? SB 412 & 458: Proposed: More short sale legislation proposed. "This firm knows what they are doing . SLG is an unique, pragmatic law firm: In this rapidly changing legal environment, they keep me informed, protect our interests and understand our business needs". “This firm knows what they are doing . SLG is an unique, pragmatic law firm: In this rapidly changing legal environment, they keep me informed, protect our interests and understand our business needs”.